Observing shmita can be difficult both for the farmer and for the consumer. The farmer has to rely on the harvest from the sixth year to support him/her during the shmitah year or find alternative sources of income. The consumer still needs to eat fruits and vegetables (although my kids would debate that last point). In an agrarian society, one could walk up to the ownerless field and take what you need for your meals. Today we are much further removed from the fields- our produce comes from supermarkets and it is unrealistic to drive out to the country to pick a few tomatoes. Plus, as we learned yesterday, the point of shmitah produce (peirot sheviit) is not to have it sit and rot but to eat it. So what is a modern society to do? Machon HaTorah v’Haaretz– The Institute for Torah and the Land of Israel- has provided us with a solution- the Otzar Beit Din. You might recognize the symbol on certain produce in the supermarket. During the shmitah year the Oztar Beit Din becomes the middleman between the consumer and the farmer. The farmer signs a contract that the Beit Din is permitted to remove produce from his/her land and store it in the Beit Din’s warehouse. The Beit Din then distributes the produce to the members of its community. The Beit Din compensates the farmer for transporting the produce to the warehouse (and other permitted activities). The community members pay a fee to belong to the community. Since it is forbidden to weigh, sort, categorize or do any sort of commerce with peirot sheviit, the Otzar Beit Din sets up a different system for people to collect their produce. For example, the consumer pays a set price each month and the prices of the produce is set based on expenses only and therefore does not earn a profit. It is important to pick an Otzar Beit Din that is reputable and large enough to meet the supply and demand of its community. If a Beit Din is unscrupulous, it will simply become a legal loophole that allows commerce to continue throughout the shmitah year. In addition, it is important to feel that you are truly part of the community that the Beit Din represents and not just through financial support. The Otzar Haaretz Otzar Beit Din supported by Machon HaTorah v’Haaretz already has a significant number of rabbanim, farmers and consumers signed on. I will repost here the information in English that they have on their web site. Most of the information is in Hebrew. You can become members of the Otzar HaAretz Customer Club through a simple process. All you have to do is register at the site. During the course of the registration you will choose how much you intend to spend on fruits and vegetables during the coming Shmita year. We will load the sum you choose into a “smart card” which you will use as a means of payment for fruits and vegetables during the Shmita year. We will divide the sum into 12 even parts and you will be able to use the relative amount each month. For example, if you chose 600NIS for the year, you will be able to use the card to purchase up to 50NIS each month. Additionally, the card will grant you unique club benefits. Vegetables which were picked during the sixth year: During the course of this year, the sixth in the Shmita count, we purchase vegetables from Jewish farms and store the produce in various manners. From a halachic perspective, this produce is preferable since it has no connection at all with Shmita labors. Aside from this meticulous halachic observance, or “hidur” we encourage the Jewish farmers to increase their production, as long as it is still halachically permitted. Mounted trays in hothouses: This is one of our original methods for agricultural production during the course of the Shmita year. In the framework of this method we grow vegetables in closed hothouses, in sealed planters (with no openings) placed upon a sealed surface, having no direct contact with the ground. From a halachic perspective, this method is based on a combination of two opinions: (1) The opinion of those who permit planting during Shmita today in plain earth which is located inside a structure. According to this opinion, this question can be related to more leniently since in any case, Shmita laws today are “Midrabanan”/(Rabbinic Decree) according to Pe’at HaShulchan Chapter 20 paragraph 52 and other Rabbinic authorities, and (2) the fact that planting in a perforated container (with an opening) outdoors is prohibited by Rabbinic decree. Therefore a combination of the two opinions is initially permitted. This solution enables us to increase the production of certain vegetables by Jewish producers specifically during the course of the Shmita year. Vegetable produce from the Southern Arava in addition to the strict interpretation of the “Heter Mechira”; the Southern Arava is indeed included in the boundaries of the Promise to Avraham Avinu at the Brit bein haB’tarim (the “covenant of the pieces”), however with regard to the commandments unique to the Land of Israel there is a disagreement among the commentaries and the halachic decisors (“poskim”) if it [that section of land] had ever been sanctified. According to the decision of the Chief Rabbinate of Israel since the establishment of the State, the commandments unique to the Land of Israel are to be kept there (According to Rav Yechiel Mechil Tukichinsky, “The Land of Israel” pps. 34-35 and pps. 82-84; the Gaon Rav Zvi Pesach Frank ZT”L, the Gaon Rav Ovadia Hadaya ZT”L, “Yaskil Avdi Responsa” 6:2, and Rav Eliezer Waldenberg ZT”L in the “Tzitz Eliezer Responsa” 3:23). Therefore, we use this produce with the addition of the strict interpretation of the “Heter Mechira”. This way we act in a way that is acceptable according to all the approaches, and at the same time we strengthen the Arava producers and supply their produce during the course of the Shmita year. They have no prohibition of “sfichin”. Even according to the strict halachic decisors who do not allow use of the “Heter Mechira” during Shmita, it is permitted to do so and to eat its produce without treating it as having Shmita Sanctity following the sale of the land (according to the Gaon Rav Shlomo Zalman Auerbach ZT”L, “Minchat Shlomo Responsa” Section 3 158:3). Through the use of this important area we can considerably increase the marketing of our fine produce during the course of Shmita and thereby strengthen Jewish Agriculture in the Western Negev. At the beginning of the Shmita year, vegetables planted in the sixth year will be grown and harvested during the seventh, and as such will have Shmita Sanctity. Non-Jewish Produce: A small portion of the vegetables available in the Israeli market are purchased from Arab farmers all the time. We will continue to purchase from the same supply sources during Shvi’it in a manner which will not expand their share of the Israeli market. Import: If, during the course of the summer, the produce from the above sources shall run out, we will supply imported agricultural produce, although we will not supply produce from the Palestinian Authority and Jordan. For a list of supermarkets that will be carrying Otzar Haaretz produce (confirmed and in the process of signing up), click here. Of course, this being a couponing site, I have to mention that signing up for Otzar Haaretz gives you big discounts on things like the Chavaya at the Tzomet Institute, Chavaya ba Shmitah at Machon Hatorah v’Haaretz, rafting, ice skating, the visitor’s center at Mitzei Keshet, the glass-bottomed boats in Eilat and more. See all of the discounts here. Next topic in the series: heter mechira. Shmitah: Are you rooting for the home team? Today is your birthday. Your closest friend, knowing you use your computer all the time, decides to surprise you by getting all of your friends and family together to chip in and buy you a brand new laptop. This laptop just came out on the market and is the fastest, has the largest memory and the highest resolution screen. It is sleek, beautiful and is very special to you-not only because of its value but because of who gave it to you. Of course you will have to take extra special care of it, but it is worth it, right? Do you take the present and thank your friends profusely or do you yell at them in anger because of how delicately you have to treat their gift? Do you leave it on the shelf because it is too much trouble to deal with it? I know it isn’t really your birthday today. The birth of the new year, however, is coming up soon with the advent of shmitah. Produce from the land of Israel (פירות שביעית, peirot sheviit) will become holy. This means that special rules apply to this produce which has to be treated differently than during other years. You have to take care not to waste it and not to intentionally cause it to rot. This is not simple, especially with young children. Produce becomes more expensive. It is not easy to remember all of the rules involved. It is much easier and simpler to buy produce from chutz l’aretz or produce sold through the heter mechira alone which does not have kedushat sheviit- the holiness of the shmitah year. But what are you saying to our Creator when you decide to avoid peirot sheviit? Are you putting this mitzvah on the shelf because it is too difficult to deal with? In a few short weeks we will be required to make a decision regarding what type of produce we choose to purchase. We can buy produce that was grown in countries such as Jordan, Cyprus and Europe. We can buy produce that was grown in the Palestinian Territories. We can buy produce grown on Israeli land that was sold to a non-Jew. We can buy produce grown on Israeli land that was outside the original borders of Israel. We can buy produce grown in Israel by Jewish farmers but not in the ground (e.g. hydroponics). We can buy produce grown in Israel by Jewish farmers who are observing shmitah as strictly as we are. As olim chadashim and vatikim, one of the special blessings of living in Israel is being a part of mitzvot hatluyot ba’aretz- mitzvot that can only be performed in Israel. The question to ask yourselves when shmitah is here is which team will you be rooting for- the visitors or the home team? For those of you have tasted both American and Israeli cottage cheese, you know that there is no comparison. Americans, on their eternal quest to lower dietary fat, makes a relatively dry and tasteless cottage cheese. Israeli cottage cheese contains up to 9% fat. It is smoother, creamier and the one product that displaced Israelis say they miss the most. 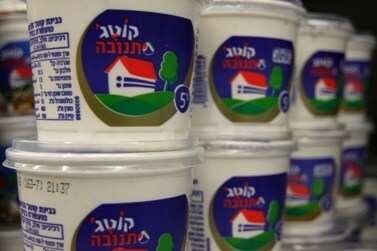 Tnuva has been unable to export cottage cheese to the US because it has a 14-day shelf life- not enough time to get to the US and stay on the shelf for a reasonable period of time. They decided to change tactics and have it produced in the US. Consumers can expect to see it on the shelves in the first half of 2015. Don’t look for the Tnuva name, however- they have decided to use a name that will assimilate better into the general American market. Cottage cheese earns Tnuva 300 million shekels a year in Israel. After all the price wars regarding cottage cheese in 2011, I have to wonder whether Tnuva cottage cheese will be cheaper in Israel or in America???? Print it here on on Yad Mordechai’s Facebook page. Joshua Frankel is an ordinary citizen who got curious one day. He prefers to buy canola oil because of its healthy attributes and is used to paying a hefty price for it. One day, however, he noticed a dramatic decrease in the price – almost too good to be true. So he decided to send some of the cheap canola oil to the Israeli Standards Institute laboratory for analysis. They found that these oils are not in accordance with the Israeli Standard 216 for vegetable oils. Exactly what oil they are the laboratory couldn’t answer. So Joshua Frankel formed a class action suit against the four companies whose oil he tested: Sun Oil, Antuan, Shell-Bar, and Or Paz. These companies produce “canola” oil under the brands “Sun Oil”, “Ophir”, and “Gold”. Sales of fake canola oil totaled 2 million bottles in 2014. There was no response from Misrad HaBriut printed in the original article (below). According to the manufacturers, they both have current licenses and their products have been tested previously and found to be in accordance with the standard for canola oil. The Ministry of Health is warning the public that there is a certain type of Colgate toothpaste from China and Thailand that has appeared on the market, mainly in East Jerusalem. This toothpaste is not under supervision of the Ministry of Health and does not have Hebrew labeling as required by the law. The public is asked not to use this product and to contact the call center at *5400 if you have any questions or concerns. The Ministry of Health advises the public that there are Colgate products that are under its supervision. All approved cosmetics and toiletries can be found on the Ministry of Health’s web site. Must order online at the Pizza Hut web site. The Tivall company is notifying the public that the 900 gram package of “Aruchah Tavshil Kafri” was found to have Listeria in two batches: 41693613 with an expiration date of 18.9.2015 and 41703613 with an expiration date of 19.9.2015. The public is asked not to eat the product and to call Tivall’s central line at 1-800-760-750 for more information. For more information about listeria, go to the CDC web site. There will be no ceremonial tree planting during the shmita year, except for specific circumstances that are approved by the Rabbanut. There will be no planting by students or anyone else for Tu Beshevat. JNF will not distribute seedlings for planting by outside groups, including bee farms. Preparation for planting in the year after shmita will be done on an individual basis with approval by the Rabbanut. Work to preserve trees is permitted, including destroying harmful insects and diseases as well as activities to prevent fires. The olive harvest during the shmita year (תשע”ה) will take place without any halachic restrictions. Regarding the olive harvest the year after shmita, the JNF and the Rabbanut will release their policy statement in the coming months. Harvesting carob during the shmita year (תשע”ה) can take place without any halachic restrictions. For a full list (Hebrew), go to their web site. 5 million shekels to support farmers who grow produce off the ground, which is not subject to shmita regulations.